I think it’s fair to say that when you play an MMO, you bring a great deal of your own personality traits to the game. It certainly plays a part when choosing the class for your primary character. And then there’s naming your character. Depending on your mindset you may choose something based on lore or you may pick something humorous. The entire process of creating an alt and customising each aspect of it, is our way of expressing ourselves. So, bearing this faux psychology in mind, I think it’s logical to assume that your approach to storage and the management of loot is also determined by your personality. Now I take a very spartan approach to possessions and personal bric-a-brac in my personal life. I like order. I do not like clutter and excess baggage. Everything has a place. I subsequently bring that mindset to the LOTRO and other games that I play. Therefore, if there is no immediate need or obvious use for something I have looted or been rewarded, then it gets sold ASAP. I am not the sort of player that keeps multiple armour and jewellery sets for specific instances. Therefore, as soon as I’ve acquired an item that is demonstrably better than what I currently have, the old one is replaced and either sold or deconstructed. Until recently I have not really crafted much in the game. Now I do stockpile hides, ore and wood but this is often spread around three alts or left in shared storage. However, this overall approach has been at times a double-edged sword. Frequently, I have seen players with items that have impressed me (I like to inspect those around me in MMOs). On enquiring where they obtained them, I have sometime discovered that they are standard drops from quests that I have already completed, and I therefore must have simply sold the items in my haste. Of course, I know (as I'm sure we all do) many players who are the polar opposite to me. There are numerous LOTRO aficionados who have purchased every additional storage slot available and who own multiple houses simply for the chests. Then there's the use of the shared storage, the mail and even the auction house as a means of providing a convenient overflow system. I’m amazed at how often kin mates and friends complain about their bags being full. It usually turns out that they only had half of the space available to begin with, because the rest was being used as temporary storage for an alt. I even know a few dedicated players who have so many alts and so many saved resources, that they track it all by spreadsheet. Each to their own but this utterly horrifies me. It seems like far too much of a chore. I as you may guess, I like to travel light, with just a few potions and items of food in my bags. I do however have a “Visiting Banker” in my premium house, which provides convenient access to my Vault, Shared Vault and Wardrobe. This lootbox item has proven invaluable. For the new player, LOTRO by default offers only limited storage and I have found many a thread on the official LOTRO forums about how frustrating some people find the initial storage limitations. Cautious players will also fall foul of “what if” syndrome and can end up holding onto many items based upon an assumed future need and a reticence to potentially hobble oneself. Certainly, for a while back in 2010, the Erebrandir's Horseshoe further increased this mindset, due to the items enigmatic purpose. However, time and a more streamlined development team has meant that such whimsy has not been perpetuated in the game. 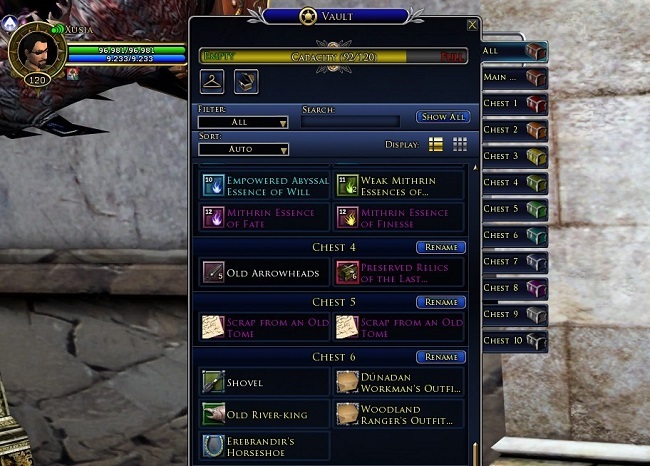 However, the potential to be a “pack rat” still exists in LOTRO due to the nature of the level and gear progression. It’s never likely to go away. However, part of the appeal of LOTRO is that you can play the game very much on your own terms and not suffer greatly as a consequence, despite what you may think. Hence you can hoard as much as you want or favour a leaner outlook. The only question you really need to ask is what play style suits you the best.